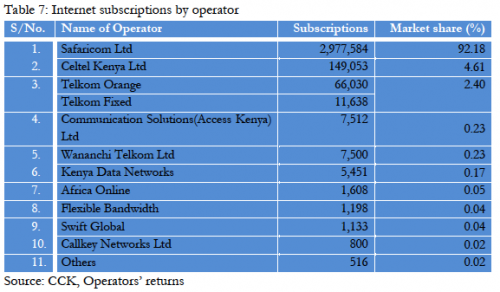 If you’ve been wondering what the numbers look like for Kenya’s mobile and ISP space, look no further than the latest CCK Report (Communications Commission of Kenya). It’s one of the best documents that I’ve seen, compiling information that you just can’t seem to find anywhere else. 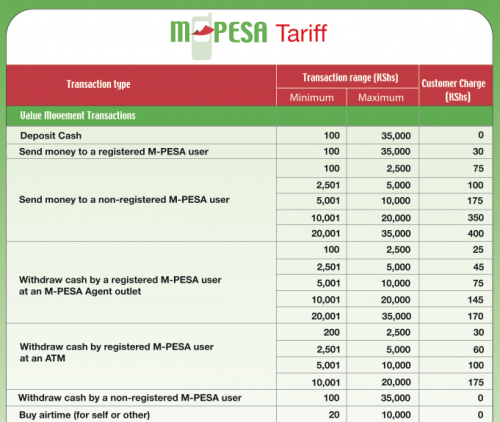 reduction on pre-paid tariffs. It comes as no surprise that there was a 68.4% increase in traffic during this period, nearly triple the norm. Interestingly, a decline in total number of text messages sent (4% less) was recorded. It’s an indicator that given the choice of lower cost voice, people would rather use that, and they do. Safaricom lost 4.8% market share, from 80.1% to 75.9% (still massive). 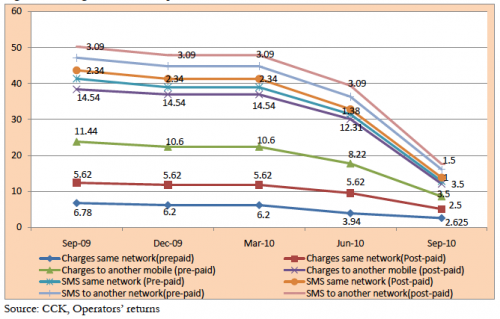 Surprisingly, it wasn’t Airtel who benefitied, as Orange made up for most of that with a 4.4% increase of their own. 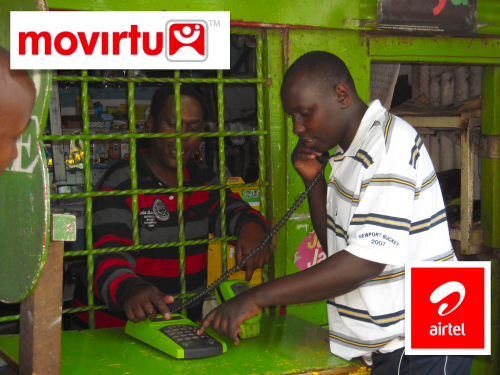 Airtel did lead the market by recording 1,143,353 new subscriptions, about 3x their closest competitor. A whopping 99% of the internet traffic in Kenya is done via mobile operators, meaning 3G, Edge or GPRS. It’s to Safaricom’s credit that they moved on this early, not dithering around on data as their competition did, effectively taking the whole market. 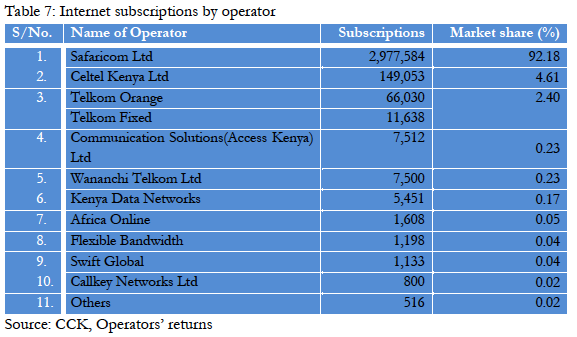 My theory is that there are only two major players in the ISP space in Kenya. The first is Safaricom, supported by this report, who will own most of the country due to having an island strategy (mobile towers). This allows them to own all the rural areas and anyone who needs decent speeds and has to be mobile. The other is the fiber bandwidth provider (ISP) who figures out and cracks the consumer market. The closest to doing this is Zuku (Wananchi) who started rolling out 8Mb/s high-speed fiber-to-the-home internet connections in Q4 2010 at only 3,499 Ksh ($45). These numbers aren’t reflected yet. My guess is that we’ll see Zuku tying up all the home internet connections in the major urban areas. 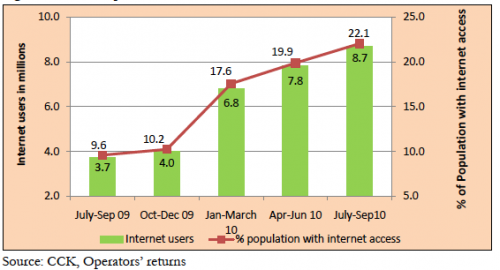 Estimates for those with internet access in Kenya is closing in on 9 million users, and at over 22% of the population, we can say we’re getting a lot closer to the critical mass needed for real web businesses and services to thrive. Overall, the numbers on both mobile and internet are trending up, and at a very favorable rate. The indicators here prove that you should be paying a lot of attention to mobiles and data connectivity in Kenya. If you’re a business, what’s your mobile plan? How are you providing and extending your services over the internet (and no, a website is not enough)? If you’re an entrepreneur, how are you going to use this information to decide what to build? Are you paying attention to the wananchi, building apps for the upper class? The only time I’ve ever seen an event have more people at the iHub is at the grand opening back in March, and Barcamp Nairobi over the summer. 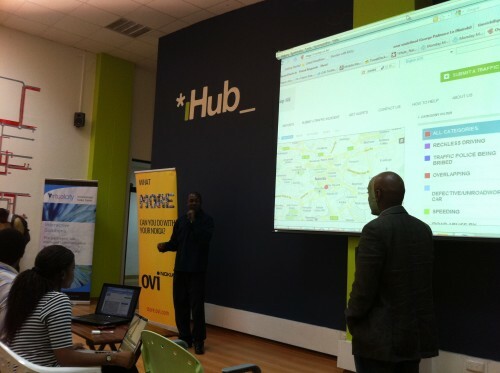 Today is Mobile Monday, an event that happens at the iHub about once per month, run by John Wesonga. It’s quickly becoming a big event to be at. Jamila talks about the genesis of their idea, M-Farm: To bring farmers together to buy and sell together. IPO48 put together a competition for Kenyan techpreneurs to pitch their ideas – the Akirachix won the 1,000,000 Ksh prize with the M-Farm idea. Prices are found by information collection through crowdsourcing of that information from the farmers and by having people go out and find out the prices from the sellers as well, in locations all over Kenya. Their goal is to give the farmer more information, through reports, to help the farmer make an informed decision on what to grow next. It’s a mixture of historical sales, predicted weather, and other information that would help them make a better decision. M-Farm works with the farmers cooperatives as well. The unique thing about M-farm is the socialization of the farmers. It’s not just about information, it’s about the community. Limo Taboi and Kahenya are giving a presentation on overlapping, the term used by Kenyans when guys go into the wrong side of the road to pass others and cause a massive traction jam. Their new website is Overlap.co.ke. We’re trying to find a way for ordinary Kenyans to track eachother’s bad driving using the Ushahidi platform. This is everything from buses and matatus with no lights, to overlapping and reckless driving. Right now it’s a citizen effort, but they’re hoping that one day the police will take note as well. You can report in by submitting something to the website, by email in a report to overlap.kenya@gmail.com or using the #OverlapKE hashtag on Twitter. Nokia is a sponsor of tonight’s Mobile Monday. Agatha Gikunda is here to talk about the way Nokia is doing things in East and Southern Africa to engage with developers. They’re really trying to reach out to small businesses and developers to build more apps and services with Nokia software and for their handsets. Most of all, they want to help with the marketing of your new product, using the Nokia marketing infrastructure through partnerships. One example of what they’re doing took place last week. They trained 25 developers in QT and Advanced Java at the University of Nairobi. 10 universities and key training institutions were engaged and participated in the training. Another way they’re working with local developers and entrepreneurs is helping local app developers to market their product. Their example here is AfroHotorNot, an app that they go around and market at universities. Beyond local marketing, they also help you publish your work globally and make money off of your apps. Other partners that Nokia has helped market globally, beyond Kenya are Sharper Innovations (LSU, Afrohotornot and Wazzup), Symbiotic Media (Tusker Project Fame and Daily Nation Media) and Shimba Technologies (Tuvitu App and MTV Music Awards app). To get paid, Nokia takes 30% and pays out 70% to the developer. You have to have a local bank account to get paid directly, and the money is released once you reach around 100 Euros. 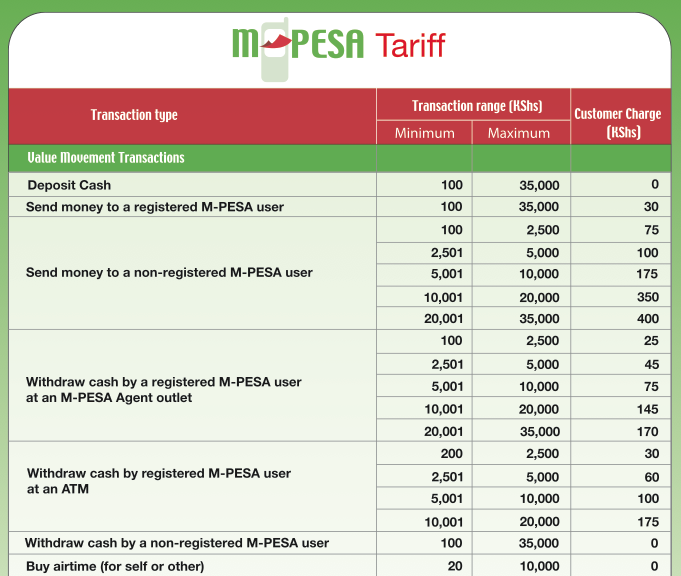 There isn’t a really good way to get paid in Kenya, but they’re trying to get a deal with local mobile operators for operator billing to happen. 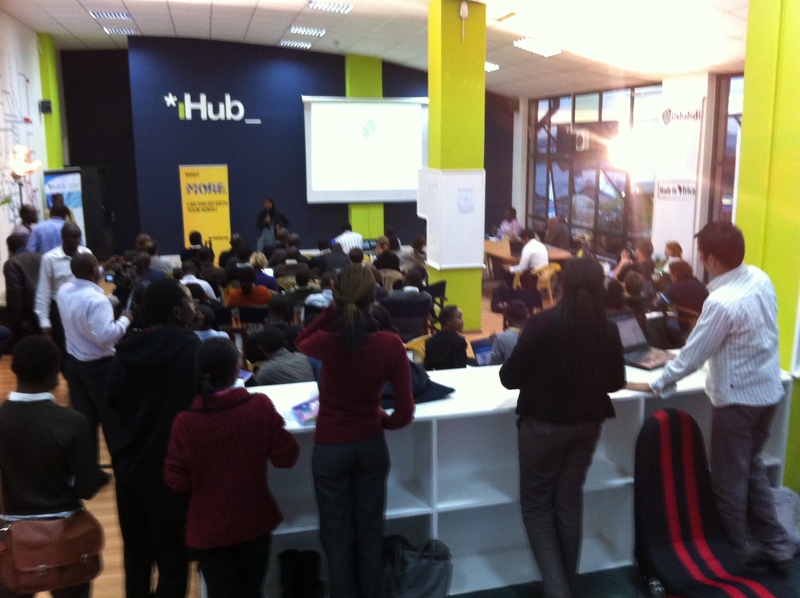 About 30 apps have been created by Kenyan devs for the Ovi Store. About 99% of those are local focused, only 3 are focused on the global market. Agatha was asked about when they’ll have local billing integration. The answer is that they’re trying but they don’t know when it’ll happen. To get started with the Nokia Ovi Store, go to publish.Ovi.com. ICT is going to make the next 500k jobs in Kenya, and Safaricom plans to be on the forefront of that. He goes on to talk about how Safaricom is trying to be more friendly to smaller organizations and entrepreneurs in the country. You used to be able to predict with some certainty the types of value added services that would work. Now, enter the smartphone and data connections, and your phone is now a vehicle to a new destination. Life became more complex to us. We now get people walking into our office saying “I have an idea, it will make money for both of us.” The people they were coming to talk to weren’t set up to take on these kinds of ideas. This made them form a “new products” division where Mpesa and the VAS team’s are seated. They’ve moved away from the stages where you’d walk in with an idea and then you’d never hear from Safaricom again. Now they have to deal with the ideas, and they’re trying to understand a better way to do that (see my post on the Safaricom Innovation Board). They’re trying to figure out how to channel it. SDP (Service Delivery Platform) plus and App store launching at the same time. Safaricom Academy (with Strathmore Univ). A way to get young innovators working on their ideas with training. The Safaricom Innovation Board – A group who helps set policy and buffers devs from Safaricom and vice versa. Nzioki won’t discuss revenue share, unfortunately. Too bad, they need to be a lot more open about the money side of this equation, otherwise it will be perceived as the same old Safaricom. Virtual City is also a sponsor for the Mobile Monday event, and John Waibochi, the CEO is here. Virtual City recently won the $1m Nokia Growth Economy Venture Challenge about 3 months ago. Another great zinger from Russell Southwood’s Balancing Act on the state of the mobile industry across Africa and what needs to change. Desert discs: How mobile phones are at the root of Saharan music. Christopher Kirkley went to Mali to make field recordings, but returned with a mixtape of music taken from Saharan Sim cards. Reflections with Michael Joseph from Al Kags on Vimeo. Ken Banks discusses the challenges of normal business models in the ICT4D and M4D space. A great deck by Rudy de Waele, from his talk at Mobile Web Africa 2010. 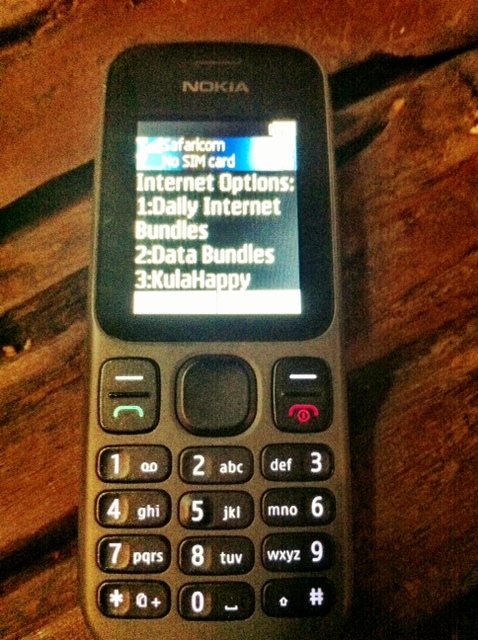 I get asked a lot about mobile data costs in East Africa, so thought I would put it in writing for everyone to find easier. Mobile data access charges have fallen drastically in the last several years in East Africa, in large part to the SEACOM undersea cable arriving and increased competition between operators. Data connectivity is the new battleground, fighting not just amongst mobile competitors, but also with traditional ISPs. In the mobile data connectivity space, each country sells either data capped bundles (or time capped bundles in the case of Uganda) that can be loaded onto a SIM card. There are out of bundle charges, priced per Megabyte or Kilobyte, but these rates are exorbitant, so anyone who connects regularly uses a bundle of some sort. More creative offerings come out each month by the mobile operators, making it more confusing and harder to compare against competing services, but also offering some incredibly low pricing for entry-level users, or consumers who donâ€™t need high speeds. 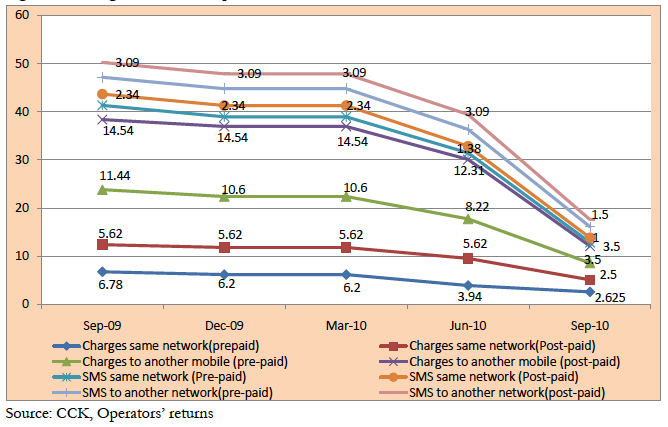 No doubt, a downward trend of mobile data charges will spur the growth of mobile web usage and publisher forwards. In Kenya, from charging internet usage at 10 shillings a minute just a few years ago, now cyber cafes charge 1 shilling a minute for browsing. 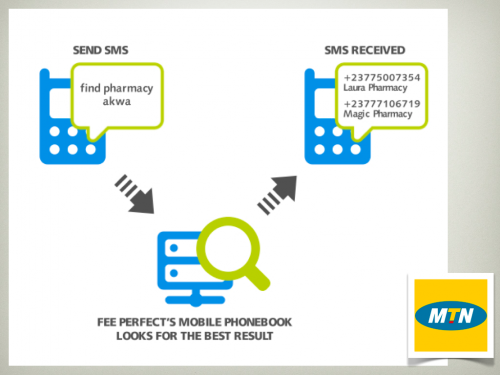 The use of mobile data has been made easier by increasingly cheaper rates. For example in Kenya, Safaricom are offering a limited 10MB worth of mobile internet usage at 8 shillings per day. Zain Kenya offers unlimited internet usage for 3,000 shillings per month. Orange Kenya on the other hand are having a 7-day unlimited offer for their 3G network at 1000 shillings. Tanzania boasts some of the most unreliable data networks with the least penetration within East Africa. Zain and Vodacom both offer 3g, while Tigo offers GPRS. Zantel and Sasatel are CDMA networks, with EVDO connectivity. All networks, no matter what the speed of the connection, charge a flat rate of 40,000Tsh for 1gb of data. Data prices have gone down, but not noticeably. As is true in this hyper competitive market, these numbers will change (hell, I’m probably already off on something). The overriding trend is that the costs are going down for consumers, even if slower than we’d all like to see.